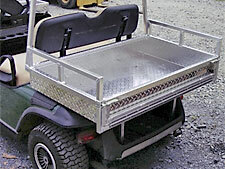 Aluminum bed with fold down tailgate and canopy support as well as front storage box. 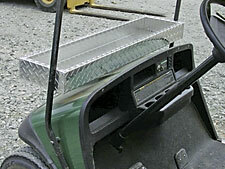 Dress up panels, fenders, mud flaps and more. Whether you are doing yard maintenance, campground owner or ridding grandchildren at campground, hauling your home grown berries and vegetables, own a strawberry farm or a row crop farm we can build to your needs. 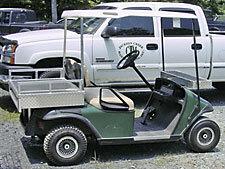 No matter how you want to dress up your cart we are here to assist you in any way we can.